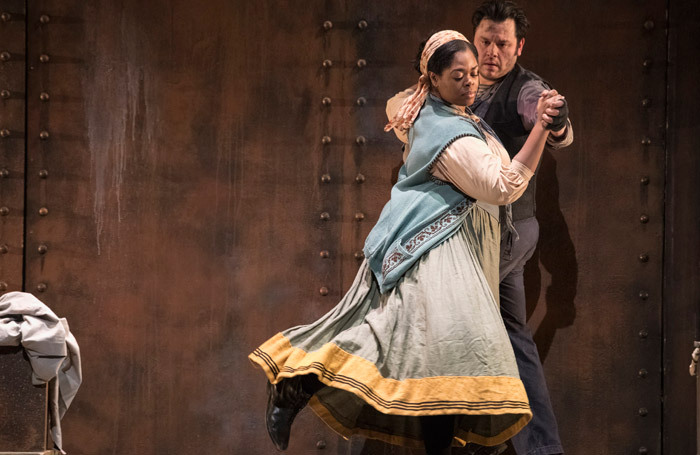 English Touring Opera’s revival production of Il Tabarro and Gianni Schicchi provides a reminder of the wide range of emotion Puccini crammed into each of his hour-long one-act operas. Il Tabarro is a domestic tragedy and Gianni Schicchi a slapstick comedy (fitting choices for ETO’s season theme of serious and comic), and this time, comedy trumps tragedy. The dark fate of Il Tabarro’s central characters is hinted at from the beginning by Neil Irish’s suitably grim, ochre-coloured set, a barge in early 20th-century Paris. Young Giorgetta is sick of her dreary life with her controlling older husband Michele, and longs to escape with her lover, Luigi. A planned late-night assignation ends with Michele killing both lovers. It’s a bleak tale, but dramatically, this production doesn’t completely cohere. Musically, there are affecting vocal moments from Craig Smith as the spurned Michele and Sarah-Jane Lewis as Giorgetta, and the pleasure of Il Tabarro’s lush score, with its many allusions to La Boheme. The naturalism of Il Tabarro gives way to the broad comedy of Gianni Schicchi. We find ourselves in overstuffed bedroom – imaginatively realised by Irish – filled with the greedy relatives of the late but not especially lamented Buoso Donati. The discovery that Buoso has left his entire fortune to the monks of Signa thwarts the Donati family’s dreams of wealth and Rinuccio’s plans to marry Lauretta, Gianni Schicchi’s daughter. Enter Schicchi himself, who devises a cunning plan to give the Donatis what they need – but not necessarily what they want. The character of Gianni Schicchi was plucked from Dante’s Inferno, where he’d been consigned to hell for stealing a family fortune. Puccini and the ETO’s charismatic Schicchi (Andrew Slater) persuade us that Schicchi was hard done by. Schicchi is an ensemble opera, and the smile-inducing costumes and the cast’s high energy are infectious. There are fine solo turns from Galina Averina as Lauretta, bringing a beguiling tenderness to the famous O mio babbino caro, and from Clarissa Meek, whose expert comic timing makes the most of the grasping Zita – she excels as well as Frugola the ragpicker in Il Tabarro.